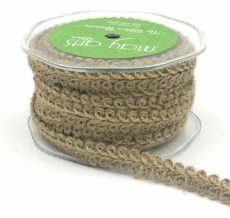 This 1.5 inch floral burlap macramé ribbon is great for adding a little fun to a gift wrap or craft project! Macramé is a form of textile product formed by a series of knotting techniques rather than weaving or stitching. Macramé can be tracked back all the way to the 18th century BCE. This flower pattern can stand alone as an edging on paper crafts and stationery or invites, as well as be mixed with beads or stones for jewelry. 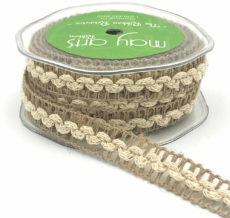 The rustic flair of the jute macrame is a favorite for belt making and wall hangings. Mix this ribbon with our other cotton ribbons for a natural motif, or combine with silk for a bohemian vibe.